CPX end feed copper fittings are manufactured in the UK under BS EN 13485 Medical Devices: Quality Management Systems. They are suitable for jointing degreased medical gas copper tube pipelines compliant to BS EN 13348, BS EN 1057 and BS 2871 Part 1 Table X as quoted in HTM 02-01 and C11. 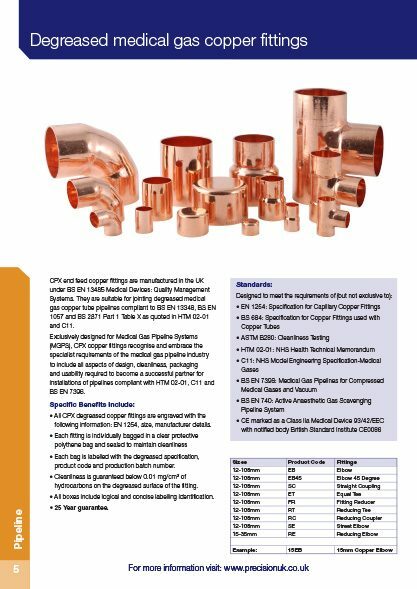 Exclusively designed for Medical Gas Pipeline Systems (MGPS), CPX copper fittings recognise and embrace the specialist requirements of the medical gas pipeline industry to include all aspects of design, cleanliness, packaging and usability required to become a successful partner for installations of pipelines compliant with HTM 02-01, C11 and BS EN 7396. 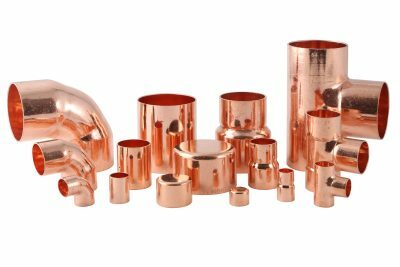 All CPX degreased copper fittings are engraved with the following information: EN 1254, size, manufacturer details. Each bag is labelled with the degreased specification, product code and production batch number. Cleanliness is guaranteed below 0.01 mg/cm² of hydrocarbons on the degreased surface of the fitting. All boxes include logical and concise labelling identification.